When all of your vehicle's wheels are lined up exactly with each other, your wheels are in alignment. Hitting a road hazard or even just the normal bumps and bounces of everyday driving in Urbana can cause your vehicle's wheels to be out of alignment. Driving for an extended time around Urbana when your wheels are out of alignment results in uneven tire wear. This is dangerous … and expensive. Worst case scenario, you have a blowout on a crowded Illinois highway. It can also cause premature wear to your suspension system, which can be really expensive to repair. At the very least, you may have to replace your tires years too early. 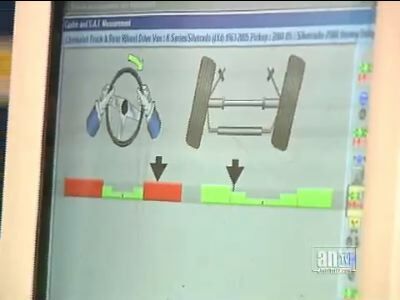 The ideal alignment for your vehicle was designed by its engineers. Alignment service at PDR starts with an inspection of the steering and suspension – to see if anything's bent or broken. Then your friendly and knowledgeable PDR technician will look at tire condition. Your vehicle owner's manual probably has a recommendation for how often your alignment should be checked – usually every couple of years. If you suspect an alignment problem, get it checked at PDR before you suffer expensive tire or suspension damage.